Conventional soybean (center) had virtually no visible weeds along the entire 100 foot plot. Organic soybean (left) had a few visible weeds towering over the crop. We initiated a 3-year study at the Aurora Research Farm in 2015 to compare different sequences of the corn, soybean, and wheat/red clover rotation in conventional and organic cropping systems under recommended and high input management during the 3-year transition period (2015-2017) from conventional to an organic cropping system. We provided a detailed discussion of the various treatments and objectives of the study in a previous soybean article (http://blogs.cornell.edu/whatscroppingup/2015/09/16/emergence-early-v2-stage-plant-populations-and-weed-densities-r4-in-soybeans-under-conventional-and-organic-cropping-systems/). This article will focus on weed densities in soybean at the R3-R4 stage in 2017. Corn preceded soybean in the rotation in this study. The fields were plowed on May 17 and then cultimulched on the morning of May 18, the day of planting. We used a White Air Seeder to plant the treated (insecticide/fungicide) GMO soybean variety, P22T41R2, and the non-treated non-GMO variety, 92Y21, at two seeding rates, ~150,000 (recommended input) and ~200,000 seeds/acre (high input). The varieties are not isolines so only the maturity of the two varieties and not the genetics are similar between the two cropping systems. We treated the non-GMO variety in the seed hopper with the organic seed treatment, Sabrex, in the high input organic treatment. We planted soybean in the typical 15” row spacing in the conventional cropping system and the typical 30” row spacing (for cultivation of weeds) in the organic cropping system. We applied Roundup (Helosate Plus Advanced) on June 21 at ~32 oz. /acre for weed control in conventional soybean (V4 stage) under both recommended and high input treatments. We used the rotary hoe to control weeds in the row in recommended and high input organic soybean at the V1-2 stage (June 2). We then cultivated close to the soybean row in both recommended and high input organic treatments at the V3 stage (June 12) with repeated cultivations between the rows at the V4-V5 stage (June 22), the V5-V6 stage (June 28), the R1 stage (July 5), and the R2-3 stage (July 20). We estimated weed densities at the R4 stage (August 14th) by counting all the visible weeds along the 100 foot plot across the entire 10 foot plot width. Conventional soybean had very few visible weeds in 2017 with most plots totally weed-free, regardless of input treatment (Table 1). Weed densities in the preceding conventional corn crop were also very low in the dry 2016 growing season, fewer than 0.40 weeds/m2 in all treatments (http://blogs.cornell.edu/whatscroppingup/2016/07/27/emergence-plant-densities-v3-stage-and-weed-densities-v14-stage-of-corn-in-conventional-and-organic-cropping-systems-in-2016/). Evidently, robust soybean vegetative growth associated with the wet June and July conditions coupled with a low number of seeds in the weed seed bank allowed conventional soybean to outcompete the relatively low number of emerging weeds after a timely Roundup application in 2017. 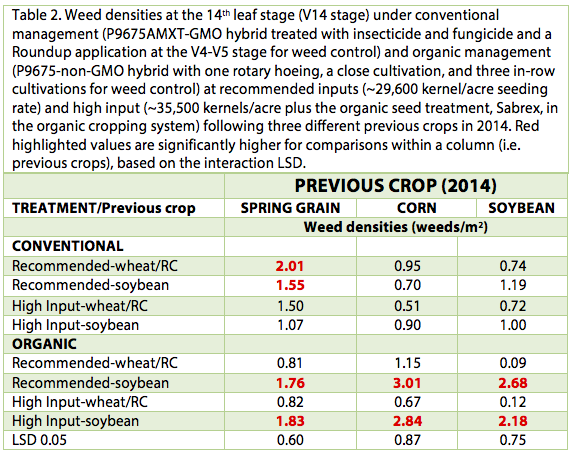 Although weed densities were greater in organic compared with conventional soybean in 2017, organic soybean had relatively low weed densities, averaging less than 0.50 weeds/m2 in fields that had a spring grain or soybean as the last conventional crops in 2014 (Table 1). Unlike the 2015 and 2016 growing seasons, high and recommended input treatments had similar weed densities in organic soybean, despite the different seeding rates. Organic corn, the preceding crop, also had relatively low weed densities in 2016, fewer than 1.25 weeds/m2 in all treatments. Although weed densities were low, leaf area and biomass of all weeds in organic soybean were quite high. Unfortunately, August turned dry at the Aurora Research Farm (1.47 inches of precipitation) so the robust weeds would compete with organic soybean for the dwindling available soil water supply during the critical R4-R5 stage in soybean development. Organic and conventional soybean, however, yielded similarly in 2015 when dry August conditions prevailed (1.36 inches) (http://blogs.cornell.edu/whatscroppingup/2015/11/09/soybean-yield-under-conventional-and-organic-cropping-systems-with-recommended-and-high-inputs-during-the-transition-year-to-organic/). It will be interesting to see if that holds true in 2017. In conclusion, weed densities were exceedingly low in conventional soybean, which received a timely single application of Roundup at the recommended rate. Weed densities were much higher in organic soybean but still relatively low. Evidently, a timely rotary hoe operation followed by a close cultivation to the row and repeated cultivations between the row can maintain satisfactory weed control in organic soybean in the 3rd year into an organic cropping system, especially in a year with robust soybean vegetative growth. We expected an increase in weed densities with each successive year in the organic cropping system because of an increase of weed seeds in the weed seed bank, but that has not materialized so far. In 2018, organic soybean will follow corn in a soybean-wheat/red clover-corn rotation with relatively low weed densities in organic corn in 2017 (average of 0.60 weeds/m2) compared with much higher weed densities in organic corn in a corn-soybean-corn rotation in 2017 (average of ~2.40 weeds/m2) (http://blogs.cornell.edu/whatscroppingup/2017/08/10/wheatred-clover-provides-n-and-may-help-with-weed-control-in-the-organic-corn-soybean-wheatred-clover-rotation/). This should shed some light on how much the weed seed bank influences weed densities and subsequent yields in organic soybean in the 4th year into an organic cropping system. Organic corn with high inputs in the corn-soybean (2015)-wheat/red clover (2016) rotation had very few weeds on July 29, 2017, a few days after silking. We initiated a 4-year study at the Aurora Research Farm in 2015 to compare different sequences of the corn, soybean, and wheat/red clover rotation in conventional and organic cropping systems under recommended and high input management during the 3-year transition period (2015-2017) from conventional to an organic cropping system. We provided a detailed discussion of the various treatments and objectives of the study in a previous news article (http://blogs.cornell.edu/whatscroppingup/2015/07/23/emergence-early-v4-stage-and-final-plant-populations-v10-psnt-values-v4-and-weed-densities-v12-in-corn-under-conventional-and-organic-cropping-systems/). Unfortunately, we were unable to plant wheat after soybean in the fall of 2016 because green stem in soybean, compounded with very wet conditions in October and early November, delayed soybean harvest until November 9, too late for wheat planting. Consequently, corn followed soybean as well as wheat/red cover in 2017 so we are now comparing different sequences of the corn-soybean-wheat/red clover rotation with a corn-soybean rotation (Table 1). This article will focus on weed densities in corn in 2017 at the V14 stage, the end of the critical weed-free period for corn. The red clover green manure crop (~3.25 dry matter tons/acre), which was interseeded into the 2016 wheat crop, was mowed on May 16. The fields were plowed on May 17, then cultimulched on the morning of May 18, the day of planting. We planted a treated (insecticide/fungicide seed treatment) GMO corn hybrid, P96AMXT, in the conventional system; and its isoline, the untreated non-GMO, P9675, in the organic cropping system at two seeding rates, ~29,600 kernels/acre (recommended input treatment) and ~35,500 kernels/acre (high input). The high input organic treatment also received the organic seed treatment (in-hopper), Sabrex. Conventional corn received ~250 lbs. /acre of 10-20-20 as starter fertilizer, whereas organic corn received about ~315 lbs. /acre of Kreher’s composted manure (5-4-3) through the planter. Organic corn also received a broadcast application before plowing of ~50 lbs. N/acre of Kreher’s composted manure in high input organic corn following wheat/red clover (none in the recommended input treatment); and ~100 lbs. N/acre in the recommended input and ~140 lbs. N/acre in the high input organic treatment following soybean. 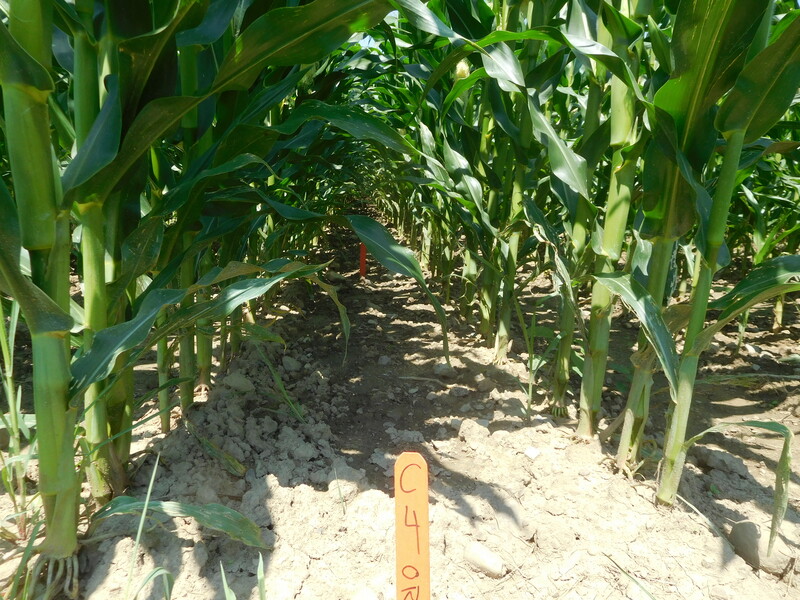 Conventional corn was side-dressed on June 15 (V3-4 stage) with ~50 lbs. N /acre in the recommended input and ~100 lbs. N /acre in the high input treatments following wheat/red clover; and ~90 lbs. N/acre in the recommended input and ~140 lbs. N/acre in the high input treatments following soybean. Unexpectedly, weed densities were lower in organic corn following wheat/red clover in fields with a spring grain (0.81-0.82 weeds/m2) or soybean (0.09-0.12 weeds/m2) in 2014 compared with conventional corn in 2017 (Table 2). 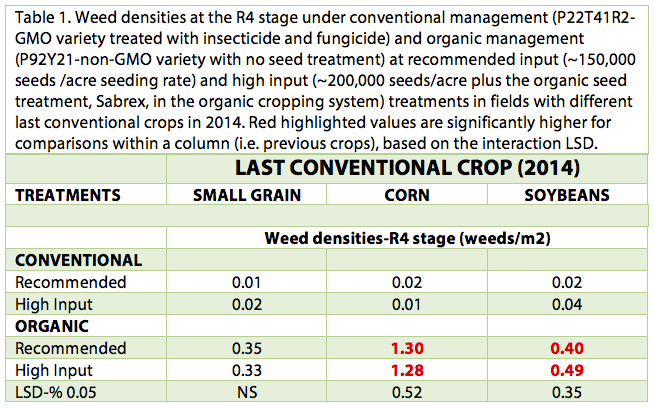 Weed densities in organic corn when following soybean in the rotation, however, in fields with corn (2.84-3.01 weeds/m2) or soybean (2.18-2.68 weeds/m2) in 2014 were greater than weed densities in conventional corn in 2017 (Table 2). Weed densities were 5 to 6 times higher in organic corn compared with conventional corn in 2015, (http://blogs.cornell.edu/whatscroppingup/2015/07/23/emergence-early-v4-stage-and-final-plant-populations-v10-psnt-values-v4-and-weed-densities-v12-in-corn-under-conventional-and-organic-cropping-systems/) and 4 to 10 times higher in 2016, regardless of inputs (http://blogs.cornell.edu/whatscroppingup/2016/07/27/emergence-plant-densities-v3-stage-and-weed-densities-v14-stage-of-corn-in-conventional-and-organic-cropping-systems-in-2016/). It is not completely clear why weed densities were so much lower in organic corn following wheat/red clover compared to following soybean (separated only by a 10 foot border row) across all three fields with different 2014 previous crops. Perhaps, there were fewer seeds in the weed seed bank in the corn-soybean wheat/red clover rotation compared with the corn-soybean rotation in the spring of 2017. In 2015, weed densities in organic soybean were so low (~0.5 weeds/m2) that we successfully no-tilled organic wheat into soybean stubble in the fall of 2015 (http://blogs.cornell.edu/whatscroppingup/2015/11/23/wheat-emergence-early-plant-populations-and-weed-densities-following-soybeans-in-conventional-and-organic-cropping-systems/). Likewise, weed densities were very low in organic wheat in the spring of 2016, (~0.05 weeds/m2), even lower than conventional wheat with recommended inputs, which also received no weed control measures (http://blogs.cornell.edu/whatscroppingup/2016/04/05/no-till-organic-wheat-continues-to-have-low-weed-densities-in-early-spring-march-31-at-the-tillering-stage-gs-2-3/). In contrast, weed densities at the V14 stage in organic corn in 2015 (corn-soybean rotation) averaged ~2.5 weeds/m2, much greater than the ~0.5 weeds/m2 in organic soybean (corn-soybean-wheat/red clover rotation) in 2015. Weed densities, however, averaged only ~0.35 weeds/m2 in the subsequent organic soybean crop in 2016. 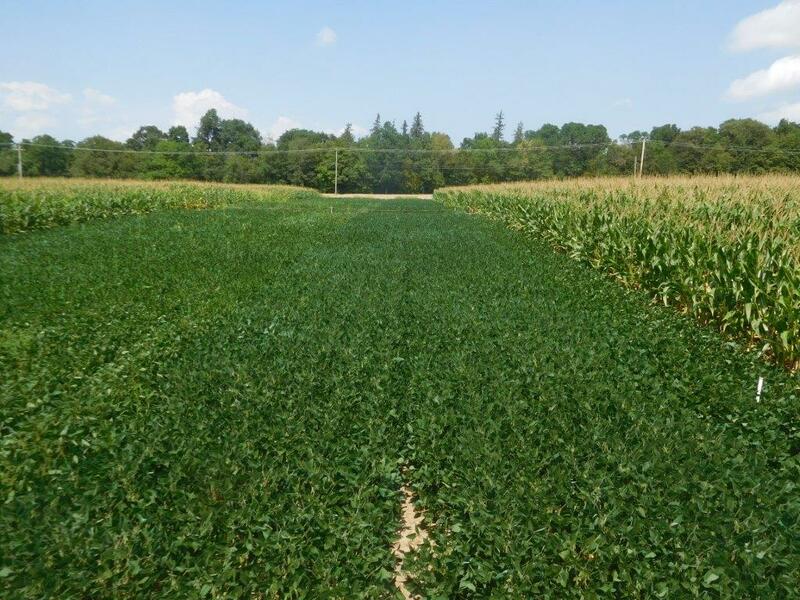 Consequently, it is not clear if the organic corn-soybean-wheat/red clover rotation had fewer seeds in the weed seed bank compared with the organic corn-soybean rotation. Another possibility is increased weed seed predation by seed predators (birds, rodents, ground beetles, etc.) in the corn-soybean-wheat-clover rotation, which unlike the corn-soybean rotation, had complete ground cover from the spring of 2015 through the spring of 2017. Wild buckwheat was the dominant weed (>80% of the weed density) in conventional corn. Unfortunately, we only sprayed Replication I when corn was at the V4 stage on June 21, but then delayed spraying Replications II, III, and IV until June 26, when corn was at the V5 stage. Weed densities in conventional corn, specifically wild buckwheat, were much lower in Replication I compared with the other three replications. Perhaps the somewhat larger wild buckwheat size at the V5 stage resulted in more difficult weed kill with Roundup. Also, corn grew taller and had an extra leaf during the intervening 5 day period, which may have resulted in poorer spray coverage on this prostrate weed. Dominant weeds in organic corn included wild buckwheat (~40%), with barnyardgrass, Pennsylvania smartweed, pigweed spp., common lambsquarters, green foxtail, and common ragweed comprising the other ~60%. Wild buckwheat in conventional corn had a pale green look but certainly was still growing. In contrast, weeds in organic corn, including wild buckwheat, were quite robust and had much greater leaf area and biomass. It is not clear if greater weed densities in conventional corn (fields with a spring grain and soybean as the last conventional crops in 2014), would reduce yields more when compared with fewer weeds with greater leaf area and biomass in organic corn following wheat/red clover. If the wet growing conditions (3.81 inches in June and 7.33 inches of precipitation in July at the experimental site) persist in August, weed densities in conventional and organic corn may not influence yields in 2017. Organic corn with high inputs (high seeding and N rates) following wheat/red clover is poised to yield as well as conventional corn in 2017. Final stands after rotary hoeing and cultivation averaged ~28,500 plants/acre, pre-sidedress nitrogen values (PSNT) values averaged ~30 ppm, and weed densities averaged ~0.55 weeds/m2. Organic corn with recommended inputs also had PSNT values above 25 ppm and weed densities of only ~0.70 weeds/m2, but final stands averaged only ~24,500 plants/acre, too low for maximum yields in NY (http://blogs.cornell.edu/whatscroppingup/). As of this writing (July 31), there are another 4 weeks before final yields of corn will be determined in this experiment so speculation on yields is premature.